Are you looking for a conversation piece to add to your outdoor garden or indoor entertaining space? Our custom stone fountain pieces offer you that distinctive look and sound that you and your guests will truly notice and appreciate. Homes in Northern Michigan should reflect the natural elements of the area and exude relaxation. 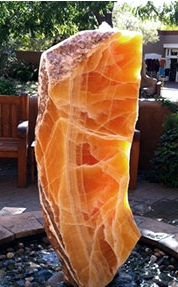 This type of stone fountain brings your senses to life! The sound and look will bring your patio, deck or balcony to the next level of bespoke design. Decades of water wear on this type of stone calm the body and mind. Imagine adding this fountain to your yoga studio or home gym! Create a meditation experience in your home. DIY Kits are available as well as professional installation.